I’ve been making this recipe since I was a child. 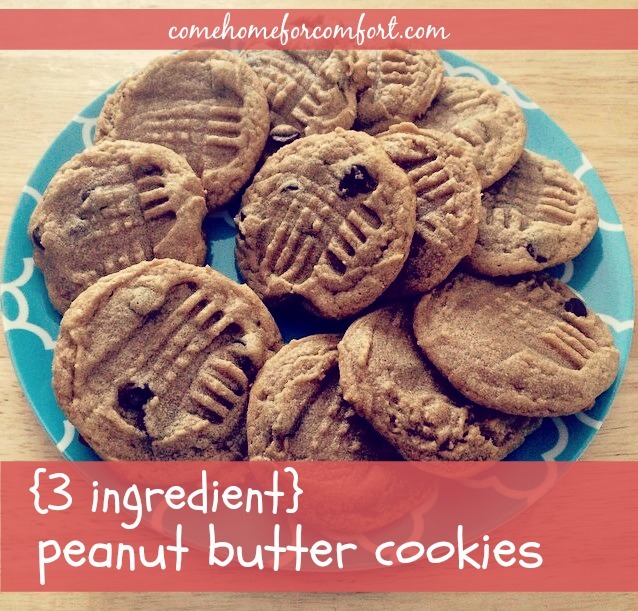 It makes a soft, moist peanut butter cookie – and it only takes three ingredients! Preheat oven to 350 degrees. Mix ingredients and form into balls (a cookie scoop works really well for this). Place on an ungreased cookie sheet and flatten with a fork, creating a criss-cross pattern. Bake for 7 minutes or until the edges are set. Let cool on the cookie sheet for one minute, then transfer to a cooling rack. The key to success with these cookies is underbaking them. Take them out of the oven early, otherwise you end up with a dusty, crunchy cookie. Unless that’s your thing. Then by all means, bake ’em till they’re dark. You can also add in chocolate chips or candy pieces, that makes them extra good!! I’m joining Meal Plan Monday! My mom always made peanut butter cookies with a long list of ingredients throughout my childhood. She came across this same 3 ingredient recipe a few years back and I remember her saying, “How could that possibly turn out?” She’s been making them that way ever since. 😉 Gotta love a simple yummy recipe with ingredients that are likely always on hand! I know, right?! This is one of the few GOOD cookie recipes that doesn’t include flour! Cookies sound amazing! I agree – peanut butter cookies need to be underbaked. They seem to quickly go over the edge if you neglect them for even a few seconds. LOVE the sound of the pumpkin coffee cake!!! Glad you introduced that to me! Definitely try the coffee cake. It’s moist and always turns out perfectly for me! I’ve got to try those cookies! They seem so easy! They are a breeze! Hope you love them!